Chandigarh : Dr.R.Kumar, Managing trustee of Society for Promotion of Ethical & Affordable health Care (SPEAK) was the main speaker during this workshop. 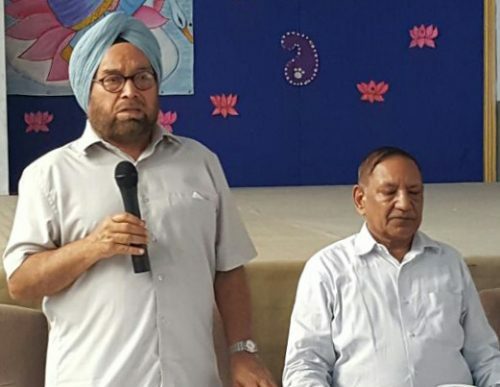 Approximately 150 teachers of various schools in Chandigarh, Parents of the students & other Invited Guests of the city have participated in the workshop. Mr. B.S.Kanwar, Principal of the school, while welcoming the Guests highlighted the importance of Healthy lifestyle in our society and especially for the growing children. Healthy lifestyle is important because it helps a person to control weight, boost energy, improve his mood, combat disease and live long. A person has a healthy lifestyle by exercising regularly, eating right and resting enough. Good nutrition is animportantpart of leading ahealthy lifestyle. Combined with physical activity, your diet can help you to reach and maintain ahealthyweight, reduce your risk of chronic diseases (like heart disease and cancer), and promote your overall health. Healthy habits such as eating a low-fat diet and living an active life help a person to maintain a healthy weight or to reduce excess weight. Simple habits such as walking, taking the stairs and eating fruits and vegetables are effective in weight control. An active lifestyle activates brain chemicals that make a person feel relaxed and happy. A healthy lifestyle leads to a better physique, which boosts self-esteem and confidence. Healthy habits prevent diseases such as high blood pressure, stroke, depression, diabetes, arthritis and certain types of cancer. An active lifestyle also improves muscle strength, which gives a person more energy. Evidence shows that people who walk 30 minutes every day reduce the risk of dying prematurely. Exercising enables a person to enjoy the outdoors, unwind and become happy, according to Mayo Clinic. It also allows a person to connect with friends and family. An active lifestyle is more rewarding when people do what make them happy, advises Mayo Clinic. People who have chronic health problems should consult a doctor before engaging in physical activities. Dr. R. Kumar, while delivering his speech explained the importance of rational use of Medical Services in our society. He cautioned over the unnecessary of medicines, diagnostic tests, interventions by the patients and doctors. Most ailments are trivial and are self limiting. Many other symptoms may be due to underlying stress. The consultation of a doctor, use of medicines of surgery should not be a habit-it should be done when absolutely necessary. Unfortunately antibiotics, pain killers, tonics, tranquilizers more often abused by the patients, than prescribed by the doctor. Irrational use of medicines is a major global problem worldwide. WHO estimates that more than half of all medicines are prescribed, dispensed or sold inappropriately, and that half of all patients fail to take them correctly. The overuse, underuse or misuse of medicines results in wastage of scarce resources and widespread health hazards. Examples of irrational use of medicines include: use of too many medicines per patient (“poly-pharmacy”); inappropriate use of antimicrobials, often in inadequate dosage, for non-bacterial infections; over-use of injections when oral formulations would be more appropriate; failure to prescribe in accordance with clinical guidelines; inappropriate self-medication, often of prescription-only medicines; non-adherence to dosing regimes. Sufficient government expenditure to ensure availability of medicines and staff. Mr Ajit Chatha former chief secretary Punjab, who was the Chief Guest advised the teachers to bring health education as a part of the curriculum.